We may think of restricted diets as a modern invention but the reverse is actually the case. Long before Weight Watchers were telling people to count points, people had cottoned on to the idea that eating less may be healthy. When examining the diets of yesteryear, it’s important to remember that what works for some, will not work for others. What we deem as unhealthy may be perfectly healthy for someone else. With that caveat in mind, today we will be looking at Luigi Cornaro, a 16th century Venetian nobleman who lived to the age of 82 (or 99 depending who you believe) and ate only twelve ounces (340g) of solid food a day! What’s more he published a series of books on the secret of longevity. So who was this mystical Venetian and why did he eat so little? Born in Padua in the late 1400s, Cornaro had something of an unusual upbringing. He was the son of a local innkeeper, who claimed to be related to the rich and noble Cornaro family of Venice. Unfortunately the inn keeper’s insistence that his family was from a noble stock soon sullied the reputation of the Cornaro’s. As his family’s reputation began to plummet, young Luigi took to business as a means of redemption. Investing a modest stake given to him by his mother’s brother, Cornaro expanded his wealth through a series of investments, most notably in hydraulics. His returns soon surpassed even Luigi’s wildest dreams and by his late 20s, Luigi was a man of great interest in Venice. By his thirties he was patron to the local artists and commissioning exquisite Villas to live in. Now living the high life, Luigi’s appetite for excess grew, and I’m not talking about money. Luigi ate, drank and partied at every possible opportunity. Rather than burning the candle at both ends, he just burnt the candle. Such excesses broke Luigi down. At 35, his physicians told him he wouldn’t reach forty if he didn’t reform his ways. A scary message. That if I neglected to apply this remedy, in a short time it would be too late to derive any benefit from it; for in a few months I should certainly die. Within weeks Luigi had drastically reduced his diet, taking only twelve ounces of food and fourteen ounces of new wine divided among four meals per day. Despite the reservations of his friends and family about so low a quantity of food, Luigi was soon restored to full health. At 42 he felt better than at 35 and his good health continued. 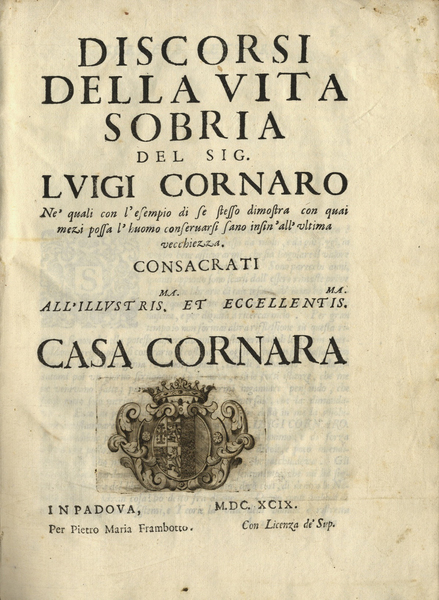 Aged eighty, Luigi was still in sound mind and body and prompted by his friends to divulge his secrets, set about penning La Vita Sobria or The Temperate Life, a four volume book detailing Luigi’s life and his health advice. ‘The Temperate Life’ are a series of musings written by Luigi from the age of 82 to about 95 and is well worth a read (available here). Having seen so many friends and loved ones die prematurely, Luigi implored readers to look after their health, both mentally and physically. Noting that old age is only desirable if one if active, mobile and alert, Luigi insisted everyone must be their own physician. For Luigi this meant being willing to experiment with the diet and note what foods did and didn’t agree with you. In Luigi’s case, he discovered that foods he previously enjoyed like dry wines, certain fruits and vegetables and meats such as fish and pork were detrimental to his health. The revelation that pastries were bad for his health was a little less shocking. On the other hand, egg yolks, veal, mutton and certain cuts of fowl aided his health. How did he know? Simple, he was mindful of how he felt after he ate. I have also preserved myself, as far as I have been able, from those other disorders from which it is more difficult to be exempt; I mean melancholy, hatred, and the other passions of the soul, which all appear greatly to affect the body. O, how glorious is this life of mine, replete with all the felicities which man can enjoy on this side of the grave! I am not troubled with passions, and my mind is calm and free from all perturbations and doubtful apprehensions. Nor can the thought of death find room in my mind, at least, not in any way to disturb me. If that isn’t an endorsement for living La Vida Sobra, I don’t know what is. We do have more understanding of the science behind it. The key factor seems to be autophagy, which is the result of ketosis. Calorie restriction is a form of ketogenic diet, although ketosis and autophagy can also be achieved simply through fasting. When autophagy is blocked, the health benefits of calorie restriction are eliminated. Hi Benjamin, thanks for getting in touch with such an informed post. Absolutely fascinating and I must commend you on the website! I enjoyed writing that post. I’ve been experimenting with my diet for decades. But it is only this past year that I learned about ketosis, although I had discovered its affect long ago without realizing what it was. It’s amazing how much info is out there, once you start looking for it. I follow my curiosity, but I first have to learn that something exists before I can become curious about it. I simply never came across ketosis before, as it isn’t something that comes up much, not even in alternative health until quite recently. I’m glad I finally discovered it as it has been transformative for my own health. Hi Benjamin. Do forgive my late reply. I’m delighted to hear you’re finding Keto so beneficial. I’ve just come off a four year stint of it so still have a great fondness for it. It’s amazing how much information there is isn’t there? Wait to you go into the weeds with keto-adapted recipes. That’s a world onto itself! Out of curiosity, why are you coming off a four year stint of keto? What is your diet now? And what led to the change? If you don’t mind my asking. Yeah. I’ve been messing around with recipes this past year. Most of my cooking has been in terms of low-carb paleo. But it’s basically the same kind of recipes as keto, except I exclude grains and most dairy (besides some ghee). I’d been doing it for four years and had just completed a natural bodybuilding show. Knowing my cravings would be out of control afterwards I reintroduced carbs so that instead of gorging on food I ‘treated’ myself with previously forgotten foods like oatmeal! I still follow a relatively low carb diet, c. 150-200g carbs, 200g protein or so and the rest fat so I’m still firmly in the fat is good camp! What was your bodybuiding show and what did that have to do with carbs? Were you experimenting with how carbs affected your workouts or the results? Anyway, what do you think about bringing more carbs in your diet? And why did you choose oatmeal? I’ve been strict with my carbs lately. But I’ve been thinking about eventually going back to a more basic low-carb paleo diet, maybe with an occasional sweet potato. I was intentionally abstaining from many plant foods for a while, as a way to reset my metabolism after so many decades of sugar and carb addiction. It’s been an informal elimination diet. I’m curious to see how my body responds as I bring foods back into my diet. Also, now that Spring is beginning, the wild berries will be growing nearby and I have not intention of resisting their allure. I’m fine with that. It could be a good thing to be less low-carb in the warm time of the year. Thanks for stopping by! It was a natural bodybuilding show. From previous experience I knew that after 12 – 16 weeks of heavy dieting that I was liable to binge eating in the weeks after the contest finished. I reintroduced carbs because I knew that it would help quell food cravings without over eating – put simply it was a mental trick rather than any biological reason. In terms of bringing carbs back into my diet, its difficult to know the effect that its hard. My strength has increased and I’ve put on muscle BUT I was in a heavy caloric deficit for months (I got to 5% body fat as verified by a DEXA scan). So it may just be the increased calories. I chose Oatmeal because I’m a stereotypical Irishman at heart and we love our oatmeal! Effectively I’m still low-carb/paleo and like you I used Keto to reset after years of high sugared foods. I find it useful to listen to your body. I flourished on Keto for many years but eventually I knew it was time to reintroduce carbs. I was initially afraid I would move back towards high carb/sugary foods but thankfully Keto helped to retrain my brain. The berries sounds like a good addition to your diet, especially if they’re fresh. Even when doing Keto I included blueberries or strawberries most days without issue so would certainly support that idea!